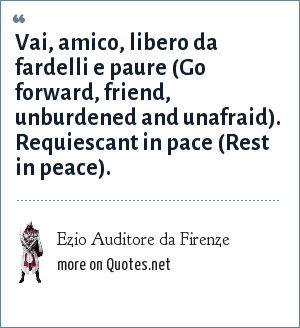 Ezio Auditore da Firenze: Vai, amico, libero da fardelli e paure (Go forward, friend, unburdened and unafraid). Requiescant in pace (Rest in peace). In real life, an Italian nobleman born in Firenze(Florence), Italia on June 24, 1459. In the Multiplatinum Game series, Assassin's Creed®, by Ubisoft, he is an Italian Nobleman who turns to the life of an Assassin. "Ezio Auditore da Firenze Quotes." Quotes.net. STANDS4 LLC, 2019. Web. 25 Apr. 2019. <https://www.quotes.net/quote/57344>.